Hares, Rabbits, ducklings and lambs. All the sweet friends as a lovely eastern gift. 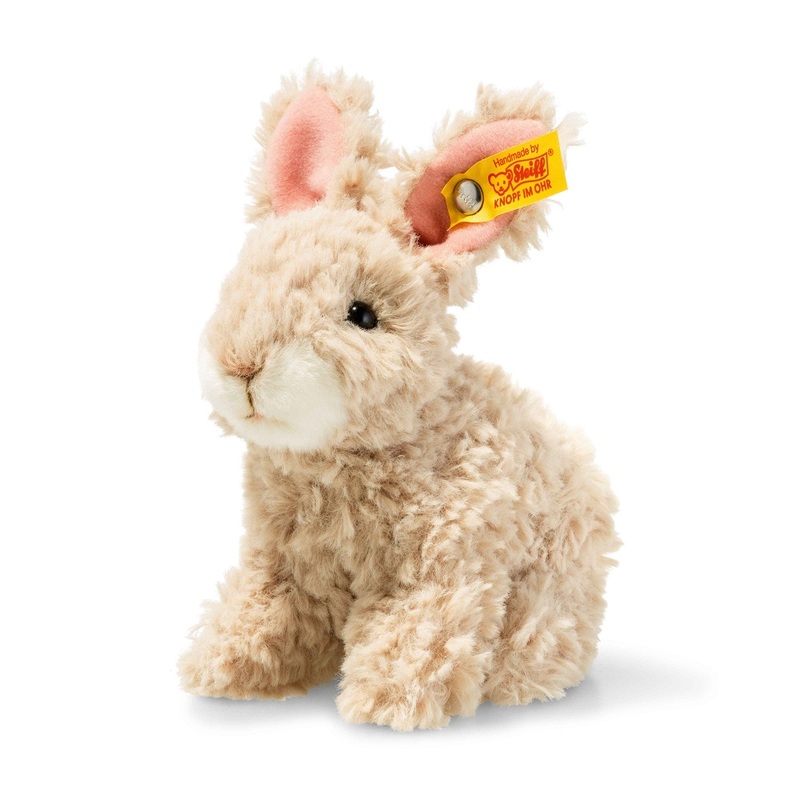 Steiff Animals for a nice Easter decoration or simply.... to HUG. 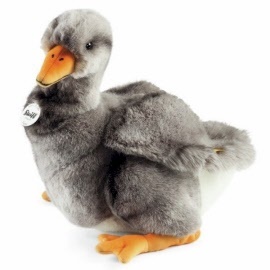 Steiff EAN 079016 Goose, 14 cm. 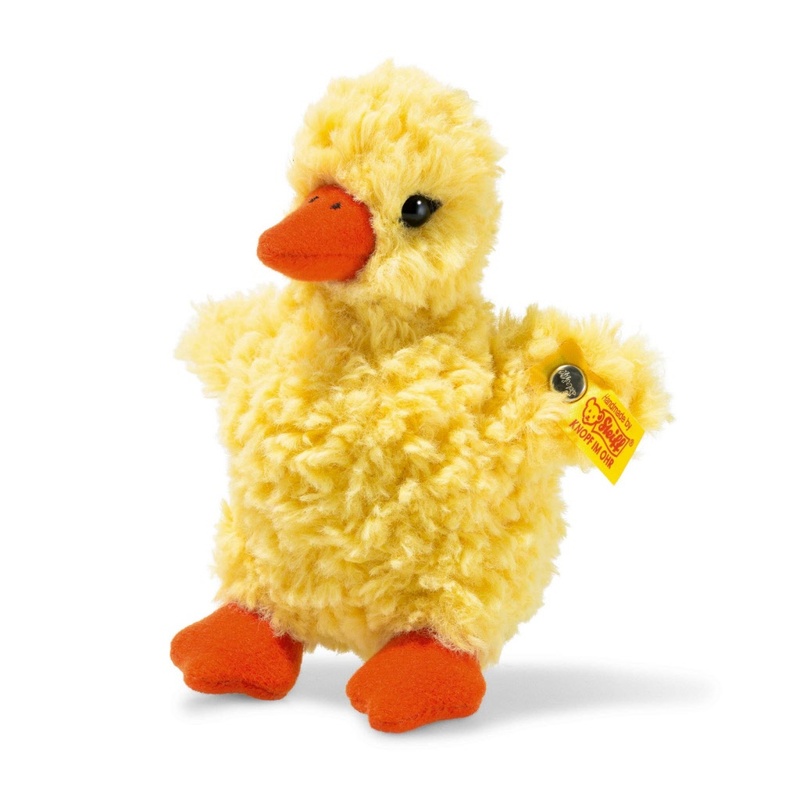 Steiff Yellow Goose EAN 079016 is made of cuddly soft sunshine yellow woven plush. Steiff Yellow Goose is standing. 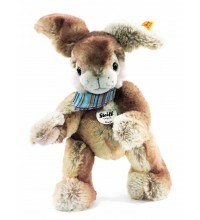 Yellow Goose is machine washable at 30 degrees C.
Steiff EAN 080517 Mümmel Rabbit, 14cm. Mümmel Rabbit is made out of soft beige plush. He is filled with synthetic filling material. He has airbrush details and safety eyes. He is sitting. He is machine washable at 30° C and has the CE mark for safe toys. He has a stainless steel button in his left ear. 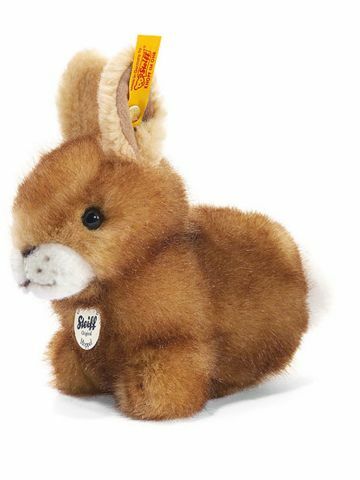 Steiff Cosy EAN 080081 Hoppel rabbit brown, 14cm. 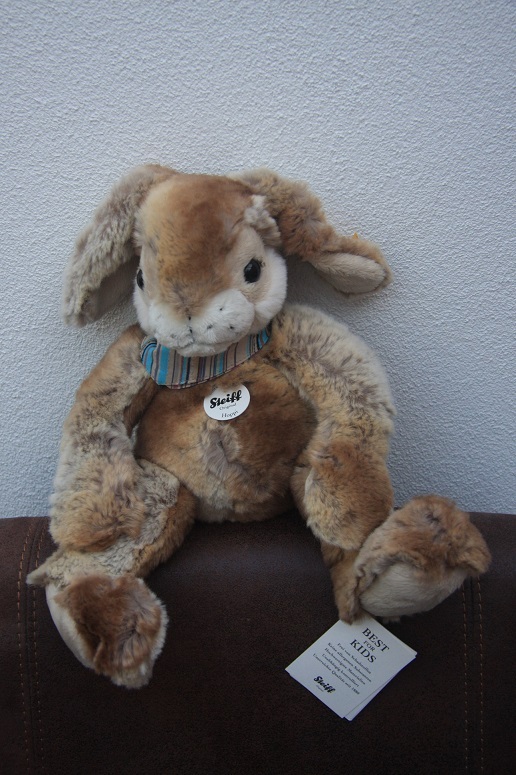 Hoppel is made of soft gold brown with white plush, has a plush nose and safety eyes. Hoppel is stuffed with synthetic material. Hoppel is machine washable at 30 degree C and has the CE mark for safe toys. Hoppel has a gold plated button in his left ear. Steiff EAN 074073 Tapsy gray Goose, 32 cm. Tapsy is made of soft grey and orange plush, has safety eyes and a plush nose. He is filled with synthetic stuffing material and Machine washable (30 degree C). He is with the CE mark for safe toys. Note: Tapy's wings are put together with a ribbon. For young childres is the advice to remove the ribbon before Tapsy is going to be their toy. 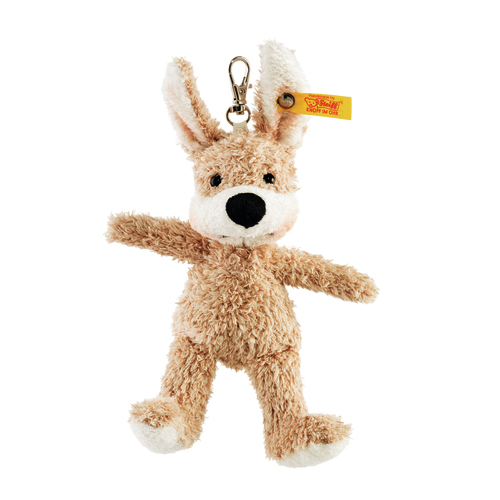 Steiff EAN 280344 Hoppi dangling rabbit 26 cm. 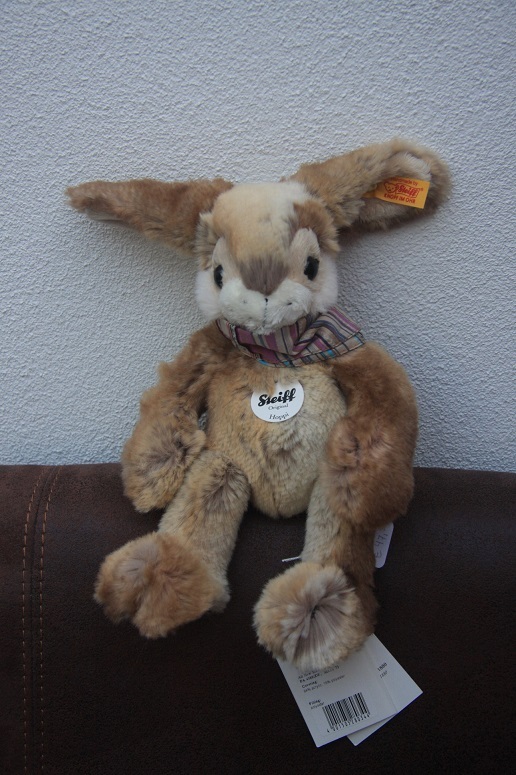 This Steiff rabbit is made out of beige / brown plush. He is filled with synthetic filling material and has safety eyes. 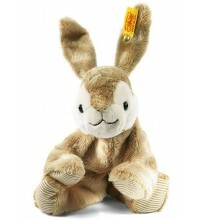 This dangling rabbit is machine washable at 30° C.
This Steiff Hoppi rabbit has the CE mark for safe toys. Steiff Hoppi has a gold plated button in his left ear. Linda is 16 cm. / 6.4" tall and made out of cuddly soft white plush. She has a hand embroidered nose and black safety eyes. She is filled with synthetic filling material. She is machine washable and 100% safe for your child. She has a gold plated button in her left ear. 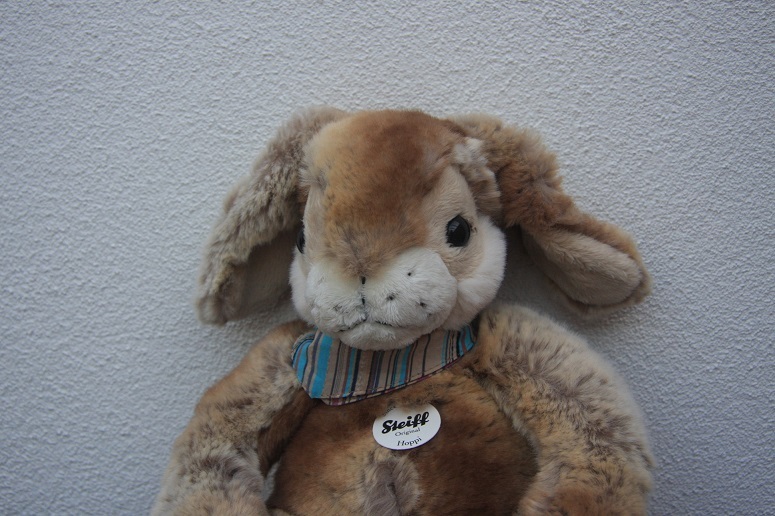 Steiff EAN 281273 Floppy Rabbit, 16cm. 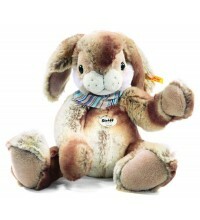 Hoppy Rabbit, she is made of brown/creme cuddly soft plush and stuffed with synthetic filling material and pellets. She is with safety eyes and mashine washable at 30 degree C. She has the CE mark of safe toys for baby and small children. 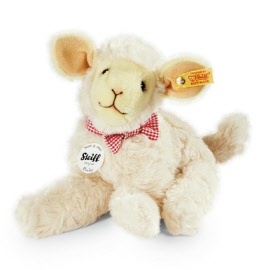 Steiff EAN 281280 Floppy Linda Lamb, 16cm. 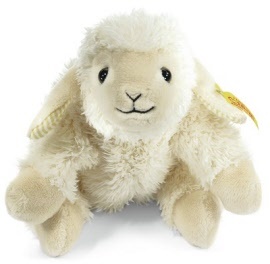 Steiff Linda Lamb is made of creme cuddly soft plush. She is stuffed with syntetic filling material and pellets. She has safety eyes and is machine washable at 30 degree C. She is safe for baby and young children. She has the CE-mark for safe toys. Steiff EAN 281129 Floppy Linda Lam, 22cm. Steiff Linda Lamb is made of creme cuddly soft plush. She is stuffed with syntetic filling material and pellets. She has safety eyes and is machine washable at 30 degree C. She is safe for baby and young child. Steiff EAN 112416 Mr Cupcake Pendant, 13cm. Mr Cupcake pendant is made out of beige soft plush.He is filled with synthetic filling material and has embroidered eyes. Mr Cupcake is machine washable at 30° C (in a laundry bag) and has the CE mark for safe toys. Steiff EAN 112386 keyring Lamb, 10 cm. 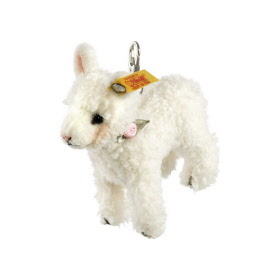 Steiff keyring Lamb is made out of white plush. Steiff Lamb keyring has a button in his left ear. Steiff EAN 080432 Piepsi kuiken, 14cm. Steiff Piepsi is gemaakt van geel pluche met oranje snavel en poten, ze heeft veiligheids ogen en is gevuld met synthetisch vulmateriaal. Piepsi is wasbaar in de machine op 30° C.
Ze heeft het CE keurmerk voor veilig kinderspeelgoed. Steiff Piepsi heeft een knop van edelstaal in de linker vleugel. Steiff EAN 073090 Flocky Lam, 15cm. Steiff Flocky is 15cm tall and made out of creme plush. She is filled with synthetic filling material and has safety eyes. She is machine washable at 30° C.
Flocky has the CE mark for safe toys. Steiff Flocky has a stainless steel button in her left left ear. 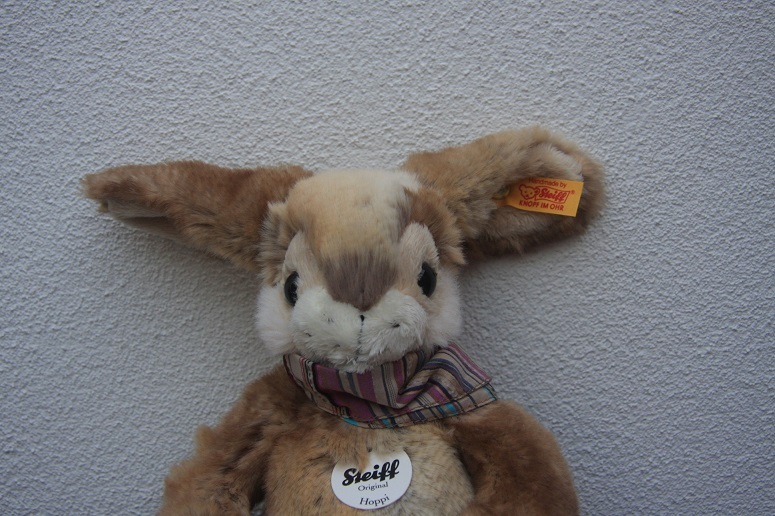 Steiff EAN 122620 Hoppi dangling rabbit 35 cm. 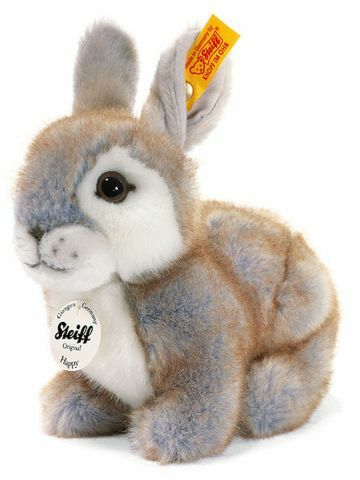 Steiff Cosy EAN 080036 Happy Rabbit, 18cm. Happy is made of soft grey/brown with white plush, has a plush nose and safety eyes. Happy is stuffed with synthetic material. Happy is machine washable at 30 degree C and has the CE mark for safe toys. Happy has a gold plated button in his left ear. 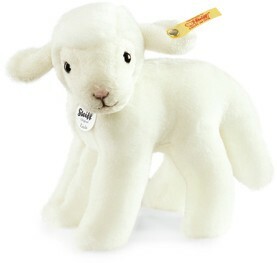 Steiff EAN 103117 Flocky lamb, 24cm. 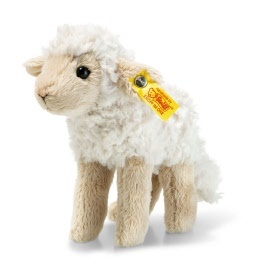 This Steiff lamb is 24 cm. / 9.6" tall and made out of soft wool white colored plush. Steiff Flocky has safety eyes. Flocky is machine washable at 30° C.
Steiff Flocky lamb has the CE mark for safe toys. Flocky has a gold plated button in her left ear. The best shopping cart software by ShopFactory powers D55. All-in one eCommerce software and shopping cart.